Magic in the Moonlight is a 2014 American romantic comedy film written and directed by Woody Allen. It is Allen's 44th film. The film stars Emma Stone, Colin Firth, Hamish Linklater, Marcia Gay Harden, Jacki Weaver, Erica Leerhsen, Eileen Atkins, and Simon McBurney. Set in the 1920s on the French Riviera, the film was released on July 25, 2014, by Sony Pictures Classics. Magic in the Moonlight received a generally mixed reception. Critics praised the performances of Firth and Stone, but found its writing formulaic. Howard and Stanley travel to the French Riviera, but Stanley is soon astonished by Sophie's ability to go into a fugue state and apparently pull out highly personal details about him and his family. Stanley witnesses a seance in which Sophie communicates with the deceased patriarch of the American family. A candle floats up from the table and Howard grabs it to try to discern what trickery is at play, but is astounded to find no apparent subterfuge. Stanley begins spending time with Sophie. He takes her to visit his aunt and they drive a convertible along the picturesque rocky corniches. When Stanley and Sophie visit his aunt Vanessa (Eileen Atkins), Sophie is seemingly able, after holding aunt Vanessa's pearls, to somehow relate secret details of Vanessa's one great love affair. This finally convinces Stanley of Sophie's authenticity and he has an emotional epiphany, feeling that his lifelong rationalism and cynicism have been misguided. When caught in a rain storm, they end up at an observatory that Stanley had visited as a child. After the rain subsides, they open the roof up and view the stars. At a Gatsby-esque party, Stanley and Sophie dance. As they walk together later that night, Sophie asks him if he has felt any feelings for her "as a woman". Stanley, who has admired her talents as a mystic and is grateful to her for opening his eyes to a new worldview, is taken aback and admits that he has not thought of her that way. She leaves upset. The next day Stanley holds a press conference to tell the world that he, who spent his life debunking charlatan mystics, has finally come to find one who is the real deal. The reporters drill him with questions, but the grilling is interrupted when he receives news his aunt Vanessa has been in a car accident. Stanley is initially angry at Howard and Sophie but decides to forgive them. In a conversation with his aunt Vanessa, who has recovered from her car accident, Stanley admits and fully realizes that he is in love with Sophie. He finds her and asks her not to marry Brice, but marry him instead. Sophie is taken aback and finds his haughty, awkward proposal unsuitable. She tells him she still plans to marry the wealthy Brice. Returning dejected to his aunt Vanessa's, Stanley further admits that he fell in love with Sophie at first sight, and, saddened, is then surprised when Sophie, who had arrived before him, knocks a spirit knock. He proposes, she accepts with a spirit knock, and they kiss as the film ends. In April 2013, Colin Firth and Emma Stone joined the cast of the film. In July, they were joined by Jacki Weaver, Marcia Gay Harden, and Hamish Linklater, and director Woody Allen began shooting in Nice, France. 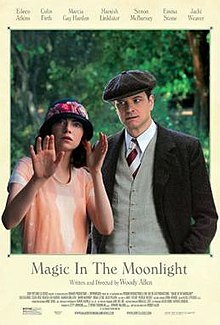 Allen revealed the film's title to be Magic in the Moonlight on October 15, 2013. The film was set to be released on July 25, 2014. On October 17, 2013, it was announced that FilmNation Entertainment would handle the international sales for the film and Sony Pictures Classics had acquired North American distribution rights to it. On July 25, 2014, the film opened in seventeen US theaters. and expanded nationwide in the US on August 15, 2014. Magic in the Moonlight received mixed reviews from critics. On Rotten Tomatoes, the film has an approval rating of 52%, based on 157 reviews, with an average rating of 5.8/10. The site's consensus states: "While far from a failure, Magic in the Moonlight is too slight to stand with Woody Allen's finest work." Review aggregator Metacritic assigns the film a score of 54 out of 100, based on 40 critics, indicating "mixed or average reviews". Rex Reed, writing for The New York Observer, gave the film a largely positive review, calling it "a masterstroke of enchantment" and praising Colin Firth's acting. Jordan Hoffman of Film.com also enjoyed the film, stating, "This picture isn’t as showy or obvious as one of his (many) masterpieces, but it is quite good and deserves your time and respect." In The New Yorker, David Denby agreed that Colin Firth "carries [the film] through." In The Wall Street Journal, Joe Morgenstern complimented Emma Stone and concluded, "Think of it as a 97-minute séance that draws you in, spins you around, subverts your suppositions, levitates your spirits and leaves you giddy with delight"
However, in Vanity Fair, Richard Lawson criticized Emma Stone's acting, arguing, "her line delivery is too modern to really work convincingly in the period, and like many other nonetheless talented actors, she has trouble with Allen’s stilted, formal cadence." He added that the age gap between Stone and Firth was "a little gross" and "icky". Alan Scherstuhl of the Village Voice disliked the film, criticizing its familiarity to Allen's previous work and believing the writing was uninspired. Chris Nashawaty of Entertainment Weekly gave the movie a "B-" grade (from A+ to F), remarking that it was funny and "pleasant" but also forgettable. Salon's Andrew O'Hehir felt that the characters were not drawn out enough because of poor writing. The New York Times' A. O. Scott wrote: "Mr. Allen has had his ups and downs over the years. Rarely, though, has he put a story on screen that manifests so little energy, so little curiosity about its own ideas and situations." In 2016 film critics Robbie Collin and Tim Robey ranked it as one of the worst movies by Woody Allen. The film opened in limited release in North America on July 25, 2014. In 17 theaters, it grossed $412,095 ($24,241 per screen) in its opening weekend. It expanded to 964 theaters on August 15, grossing $1,786,150 ($1,853 per screen) in three days. By the end of its North American run, it grossed $10,539,326. Internationally the film earned $40.5 million, for a worldwide gross of $51 million. ^ "Magic in the Moonlight (12A)". British Board of Film Classification. July 16, 2014. Retrieved March 3, 2019. ^ Thurlow-Wood, Dominic (September 22, 2014). "Magic in the Moonlight to showcase Riviera". Riviera Times. Archived from the original on September 24, 2015. Retrieved November 25, 2014. a total budget of €13.5 million. ^ a b c d "Magic in the Moonlight". Box Office Mojo. Retrieved March 12, 2016. ^ a b Scott, A. O. (July 24, 2014). "Metaphysical Sleight of Heart". The New York Times Company. The New York Times. Retrieved August 30, 2015. ^ "Colin Firth in talks to join Emma Stone in new Woody Allen movie". digitalspy.co.uk. April 30, 2013. Retrieved July 29, 2013. ^ "Emma Stone To Star In Woody Allen's Next Movie". indiewire.com. April 24, 2013. Retrieved July 29, 2013. ^ "Emma Stone In Talks For Woody Allen's Next". deadline.com. April 23, 2013. Retrieved July 29, 2013. ^ "Woody Allen's Latest Adds Jacki Weaver, Marcia Gay Harden, Hamish Linklater and More". indiewire.com. July 2, 2013. Retrieved July 29, 2013. ^ a b "Marcia Gay Harden and Jacki Weaver Join Emma Stone and Colin Firth In Woody Allen's Latest". indiewire.com. July 2, 2013. Retrieved July 29, 2013. ^ "Untitled Woody Allen Film With Emma Stone and Colin Firth is currently shooting in the south of France". unrealitytv.com. July 2, 2013. Archived from the original on December 3, 2013. Retrieved July 29, 2013. ^ "'Untitled Woody Allen Project', starring Emma Stone, begins filming in Nice, France". onlocationvacations.com. August 1, 2013. Retrieved August 2, 2013. ^ Dockterman, Eliana (October 15, 2013). "Woody Allen's Next Star: Emma Stone". Time.com. Time Inc. Retrieved August 1, 2015. ^ "Already filming in the south of France, expect a release next summer". kanyetothe.com. Retrieved July 29, 2013. ^ "First Image of Colin Firth and Emma Stone on Set of Woody Allen's 2014 Film". woodyallenpages.com. Retrieved July 29, 2013. ^ "Woody Allen's 'Magic in the Moonlight' to be Sold by FilmNation". Retrieved November 17, 2013. ^ Saperstein, Pat (January 9, 2014). "Sony Pictures Classics Picks Up Woody Allen's 'Magic in the Moonlight'". Variety. Retrieved January 10, 2014. ^ "Theater Counts for Week 30 of 2014". Boxofficemojo.com. Retrieved May 18, 2015. ^ "Magic in the Moonlight". Rotten Tomatoes. Retrieved November 4, 2014. ^ "Magic in the Moonlight (2014): Reviews". Metacritic. Retrieved July 23, 2014. ^ "That Old Black Magic: Woody Allen's 44th Film Is One of His Best". observer.com. Retrieved July 23, 2014. ^ "Review: 'Magic in the Moonlight'". film.com. Retrieved July 24, 2014. ^ "It's Been a Year Already?". villagevoice.com. Retrieved July 23, 2014. ^ Nashawaty, Chris. "Magic in the Moonlight (2014)". ew.com. Retrieved July 23, 2014. ^ “Magic in the Moonlight”: It’s time to stop making excuses for Woody Allen, Andrew O'Hehir, salon.com, July 24, 2014. ^ "Weekend Box Office Results for August 15-17, 2014". Box Office Mojo. Retrieved March 3, 2019. ^ "Magic In the Moonlight box office ('Foreign' Tab)". Box Office Mojo. Retrieved March 3, 2019.